If you’re in a relationship, Valentine’s Day probably entails a romantic dinner. Unfortunately, if you aren’t quick, getting a reservation at a nice restaurant can be difficult if not downright impossible. If your budget is still tapped out from the holidays, the whole romantic Valentine’s Day dinner concept gets even more challenging. This year avoid crowded restaurants and expensive food in favor of a romantic, home cooked meal that includes a heart shaped pizza. Throw in some candles, dim lighting, and soft music and voila – romantic Valentine’s Day dinner. The piÃ¨ce de rÃ©sistance of this Valentine’s Day dinner is the heart shaped pizza. A heart shaped pizza is cute and relatively inexpensive to make. Plus, if you have little ones and no babysitter, it’s something the whole family can have fun making together. 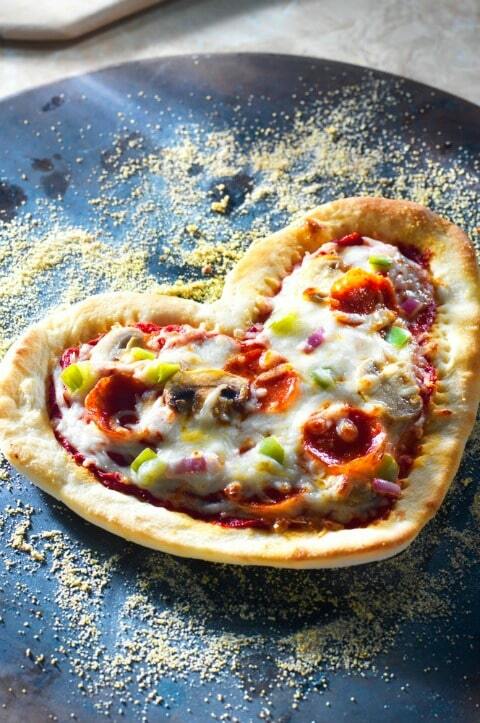 Follow the complete step by step directions on how to make a heart shaped pizza (with photos). So, for this year’s Valentine’s Day dinner, save money and impress your Valentine with this delicious heart shaped pizza recipe. This amazing heart shaped pizza was crafted by the skilled hands of Lynne Morris, a professional food stylist for 9 years who has worked with companies including Kroger, Procter & Gamble, John Morrell and HoneyBaked Ham just to name a few. View more of Lynne’s creations. The individual responsible for bringing Lynne’s handiwork to life is Larry White. He has been a professional food photographer for 15 years and has also worked for many of the who’s who in the industry. Learn more about Larry and his impressive work.